Situated off of Main Road, across from Watnall Green, Watnall test centre is relatively small for a driving test centre. It can be found next to SOLOS Consultants, an observation station and The Royal Oak. A popular option for learners living in and around Watnall, this test centre has its fair share of visitors each year. If you've decided to take the plunge and head to Watnall test centre for your practical, we'd recomend getting to know it better. Read on for directions, pass rates, test routes and much more about Watnall. The test centre is practically on the doorstep of Watnall itself, not too far from the busy M1 and B600. Learners won't have much difficulty in getting to Watnall test centre—it's as simple as following the Main Road. If you'd like to look around the centre before you start your lessons, you can find directions here. You won't be able to get your hands on the exact Watnall test route that you'll be taken on. Why? The DVSA wants to test your ability to confidently and safely handle a variety of road and traffic systems—not your ability to memorize a route. You won't be going into your practical blind, though. If you're working with a local ADI, they'll make sure you're familiar with the roads likely to feature on your test. As such, you'll be less likely to panic on the day. You can get a better idea of what to expect by looking at videos of Watnall test routes on YouTube. Overall, it’s not looking too bad at Watnall test centre. It’s certainly enough to put those test day nerves at ease! If you’re not entirely convinced, why not ask your instructor to give you a mock test? This will give you a glimpse into the test structure and also give you an idea as to which areas you’re weakest in. Wondering how to prepare for your test? Check out driving test faults explained—once you know what the examiner’s looking out for, it will give you something to focus on. What If I Can’t Go To Watnall? Watnall isn’t the only test centre available in Nottinghamshire. If you’d prefer to head to another test centre, your closest options are Colwick and Chilwell. Once you’ve driven back to Watnall test centre, you’ll be asked to park and turn off the ignition. You’ll then be told the end result—the examiner will walk you through any minors or majors using a feedback sheet. If you pass, you get your very own test pass certificate. 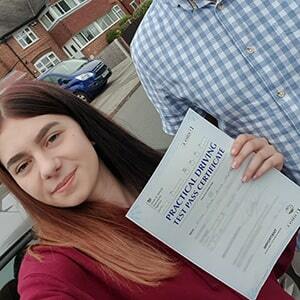 The examiner will also ask if you want to send off your provisional to get your new licence. This is the question often at the forefront of every learner’s mind—and understandably so. While we can’t offer you a guaranteed pass, we can offer you peace of mind. If you fail your test, we can speed up the booking process by fast-tracking your test. And if your confidence really is shaken, we’ve got our very own refresher courses which are ideal—the shortest is our 5 hour driving course and the longer one is our 10 hour driving course. Ready to get back on the road? Don’t wait around. Give us a ring on 0333 123 4949, or contact us via our website. If you’d like to get passed as soon as possible, you might find the perfect solution with PassMeFast. Our nine tailored crash course packages—which you can get a better look at in our driving courses rundown—are suited to all types of learner drivers and can be completed in an intensive or semi-intensive manner. Whether you’re a confident or nervous driver, our DVSA-approved instructors will get you test-ready. Book in with PassMeFast and you could be saying those magic words—“I’ve passed!”—in no time at all. Simply check out our course prices and give us a ring on 0333 123 4949, or book a course online yourself. I took a three week intensive course and passed first time! The booking team at PassMeFast is extremely helpful. Thanks again!